The Committee on Academic Support (CAS) conducts an academic review at the end of each fall and spring semester and recommends whether students should (a) continue their studies taking up to a maximum of 19 credits a semester, (b) be placed on academic probation taking up to a maximum of 14 credits a semester, or (c) be dismissed from the College. 60+ credits, the CGPA is below 2.0. For students whose total academic record shows considerable ability and marked improvement, the Committee on Academic Support may give special consideration and may not recommend dismissal but may recommend that the student be placed on academic probation. For students who have earned a 0.00 GPA in any term or if academic progress has not been achieved during the probation period, the Committee on Academic Support may recommend academic dismissal from the College. a statement concerning the projected course of study. Dismissed students and dismissed students whose appeals were not granted are not eligible to enroll in any session (fall, spring, or summer) for at least one (1) calendar year following their dismissal. Thirty (30) days before the beginning of the semester for which they wish to seek readmission, the student must write a letter to the Committee on Academic Support requesting a review of their dismissal and petitioning readmission to the College. The letter of request for readmission must document extraordinary circumstances beyond the student’s control (e.g., personal, medical, or a serious family emergency) that significantly interfered with his/her ability to successfully complete the required academic work. The letter of request for readmission must address the same areas as listed above. Permission to return is not automatic but is based upon the merits of each individual case. Students may be expected to show academic improvement through the completion of coursework at another institution. If the request for readmission is granted by the Committee on Academic Support, application for readmission must be made through the Office of Undergraduate and Graduate Admissions and students must follow the Readmission Policy as stated in the College Catalog. That is, they must place their intent in writing with the Office of Undergraduate and Graduate Admissions. Once a letter is received, the Office of Undergraduate and Graduate Admissions will process all requests through the Vice President for Student Affairs, Vice President for Finance, Registrar, and appropriate Division and Department Chairs. If granted readmission, students will follow the rules and policies listed in the College Catalog that are in effect at the time of their re-entrance to the institution. NOTE: Certain degree programs stipulate satisfactory minimum grades with regard to their own major and certain general education courses. (More specific explanations of program degree requirements can be found in the College Catalog in the Programs of Study section under each individual program.) Students who do not meet the requirements of their major and are dismissed from their program of study but have a satisfactory CGPA may apply to another major and, if accepted, continue their studies at the College. All individual mid-term grades of D, F, E, and W will be reported to the student’s advisor. It is the responsibility of the student to meet with their assigned advisor to seek advisement. To aid students in achieving academic success, the advisor might recommend the level of remediation necessary trying to ensure that a student has the opportunity to raise his or her GPA by the end of the semester. Various methods of remediation may be used by the students including routinely scheduled meetings with the advisor, the Director of Student Success and Advising, course instructors, the College counselor, and others as necessary. Students should meet regularly with their advisors to monitor their academic progress during the probation period and to discuss what remediation is needed to ensure that the student has had the opportunity to demonstrate his or her ability to benefit from instruction at Mount Aloysius College. Students on probation may take a maximum of 14 credit hours per semester and should repeat courses under the Repeat Policy as stated in the College Catalog. Students on probation must earn a 2.0 GPA or higher during every semester they are on probation. Failure to achieve a 2.0 semester GPA or better while on Academic Probation may result in dismissal from the College. HUMANITIES, SOCIAL SCIENCE, and PROFESSIONAL STUDIES - Accounting; American Sign Language/ English Interpreting; Applied Technology; Art; Business Administration; Communication Studies; Criminology; Elementary Education/Early Childhood Education; English; General Studies; Interdiscplinary Studies; History/Political Science; Information Technology; Secondary Education; Legal Studies; Liberal Arts; Music; Psychology; Religion, Philosophy, and Theology; and Social Science. HEALTH STUDIES AND SCIENCES - Medical Assistant, Medical Imaging and Radiation Sciences, Medical Laboratory Technician, Physical Therapist Assistant, Science and Mathematics, and Surgical Technology. SCHOOL OF NURSING: Nursing (ADN and RN-BSN). In order to assist students who have been dismissed from a program or who have withdrawn from the College due to unsatisfactory grades, the College has instituted an Academic Grade Amnesty Policy in addition to the Academic Forgiveness Policy. Students are eligible to apply for only one type of policy during their career at the College. Application is made through the Registrar’s Office. Grades of D, E, or F may be forgiven; however, grades of D which are forgiven do not satisfy any major or program specific degree requirements. All courses forgiven will remain on the student’s transcript but are not included in the calculation of the student’s grade point average. However, if a grade of D is forgiven it will remain calclated in the student’s cumulative credit total. Students may repeat courses in which they received a grade of D, E, or F without using the Forgiveness Policy. For more information, please refer to Repeating a Course section found elsewhere in this Catalog. Once Academic Grade Amnesty is granted and a degree is earned, a student is not eligible to apply again. Grades forgiven through the Academic Grade Amnesty Policy would remain on the student’s official transcript but would not be calculated in the cumulative grade point average (CGPA). If a grade of D is awarded amnesty it will remain calculated in the career hours earned for the student. They would remain calculated in the semester grade point average, hours earned, and hours attempted for the semester earned. A note on the transcript would indicate that Academic Grade Amnesty had been granted for those specific courses. If a student has a cause for grievance in academic matters, except concerning academic integrity issues, the student is requested to meet with the faculty member involved. If an agreeable decision is not reached, the student should then request a meeting with the Department Chairperson and, if necessary, the Dean to discuss the matter. If the matter has not been resolved at the Division/Department level and further steps are necessary, the Senior Vice President for Academic Affairs will make the final decision. The Provost/Senior Vice President for Academic Affairs may convene an ad hoc grievance board consisting of two faculty members, two students, and a fifth member from the College community and will act in an advisory capacity to the Senior Vice President for Academic Affairs. The deadline for initiating a grievance procedure is thirty (30) days after the publication of grade reports. During internal appeals, the student may not be represented by anyone other than him or herself. The three academic divisions of the College are: Health Studies and Sciences Division; Humanities, Social Science, and Professional Studies Division; and School of Nursing. Mount Aloysius College is committed to the academic integrity of the entire community. All share responsibility for maintaining high standards of academic honesty, and no forms of academic dishonesty are tolerated. Forms of academic dishonesty include but are not restricted to: giving or receiving unauthorized assistance on an examination, project, or assignment, using unauthorized forms of assistance such as crib notes or cell phones on an examination; falsification of data; plagiarism (using another person’s words or ideas as one’s own); and lying or falsifying reasons for missing examinations or class. A student found guilty of lying, cheating or plagiarism, depending on the nature of the offense and the history of the student, is usually subject to one or both of the following: a grade of zero on the assignment, project, or examination or a grade of F in the course. All cases of lying, cheating or plagiarism where a punishment is incurred are reported to the Provost/Senior Vice President for Academic Affairs, who maintains a record of all offenses. Serial offenders may be subject to suspension or dismissal. Students have the right to appeal as outlined in the policy below. The student submits a written appeal to the Provost/Senior Vice President for Academic Affairs. The deadline for initiating an academic integrity appeal is thirty (30) days after notification of the grade. The Provost/Senior Vice President of Academic Affairs consults with the involved faculty member and appropriate division chair(s) to seek a resolution to the matter. If no resolution is achieved, the matter is sent to the Academic Integrity Council. The Council shall consist of the chairperson of the division in which the offense occurred, an uninvolved faculty member from the department in which the offense occurred, another faculty member from outside the department, and a student representative to be determined by the Student Government Association. The Council reviews the case and speaks to the involved faculty member and student as needed. The Council then makes a decision regarding penalty or dismissal. The Council’s decision is final. Adding and dropping courses begins and ends at the Registrar’s Office. The student is totally responsible for accomplishing the transaction according to published instructions. Failure to follow instructions as published may affect refunds, grades, and the accurate certification of status as a veteran, financial aid recipient, or resident student. A student will be permitted to drop or enroll in a course during the first week of a semester. Exceptions must be approved by the Provost/Senior Vice President for Academic Affairs. A student may officially withdraw from a course no later than twelve (12) weeks after the beginning of classes for the semester and receive either a “WP” or “WF” grade (see Grading). Mount Aloysius College has articulation agreements with community colleges and vocational-technical centers where the College agrees to accept credits from those institutions into the associate and/or bachelor degree programs. Articulation agreements are agreements between educational institutions intending to help students transfer into various programs. The College also has articulation agreements with other institutions of higher education. Please refer to Cooperative Programs found elsewhere in this catalog for additional information on individual programs. For further information, contact the Office of Undergraduate and Graduate Admissions. 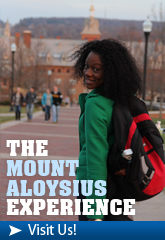 Mount Aloysius College supports the incorporation of the co-curricular into the academic life and fabric of the College. The holistic growth and development of students is at the core of the educational process. As such, the College understands the value of associated academic experiences such as involvement in theatre, the arts, athletics and student clubs, and students are encouraged to be involved in these activities. The College also understands that, at times, events can and do conflict with one another and possibly classes. The purpose of this policy is to provide structure and clarification as it relates to student involvement in the co-curricular. Students are expected to attend all classes, labs, clinicals, and internships; and faculty are expected to take attendance and keep attendance records. A student may need to miss a class/lab. Normally, students may be absent from class when they have been able to show suitable documentation that they are participating in a college-sponsored event or activity. This could include, but not be limited to, theater dress rehearsals and productions, Vox Nova dress rehearsals and productions, athletic contests (not practices), the College’s Honors Program activities and college-sponsored club events and trips. The student is responsible for meeting the faculty member prior to the event or activity to discuss course expectations. The student is responsible for obtaining the appropriate documentation and presenting it to the faculty member. If the faculty member has any questions, the faculty member could contact the sponsoring person or organization or require further documentation. It is also the responsibility of the student to fulfill all requirements, assignments, and class work due or missed as the result of an absence. The student is responsible for all material covered on the day of his/her absence. An absence/attendance policy and guidelines for make-up work should be included by the faculty in the course syllabus. Students are expected to attend all classes, clinicals, and internships. Data and research show a higher likelihood of academic success if the student is fully engaged in the learning experience (prepared, engaged, attending all learning/class sessions). Absences from classes or clinicals can put the student at risk. Courses operate differently, so faculty will describe the specific attendance/absence guidelines in their course syllabi. Students must make up any work that is missed. They should be aware that missing course work, classes, or clinicals/labs might adversely affect their academic standing and goals unless the work and learning is fully made up. Instructors retain the right to limit avoidable absences due to participation in activities. Students who are not performing at a “C” or better level, have not met the instructor’s expectations, or provide indicators to the instructor that the student’s achievement is in jeopardy, will not be permitted absence from class for college-related events and activities. In addition students may not be released from clinical assignments, internships, or other academic endeavors where their presence is required or where an absence can jeopardize their academic standing. As a Catholic college and as part of its rich heritage, Mount Aloysius celebrates the Liturgy as the traditional form of worship. Community members of all religious faiths are welcome to attend Liturgy throughout the school year. While the College respects other religious traditions and encourages students to synthesize faith with learning in whatever way they practice their individual faith traditions, familiarity with the Catholic heritage from which Mount Aloysius College derives its identity is a natural result of being a member of this community. On special occasions, the student body attends Liturgy as part of their educational experience at Mount Aloysius. These occasions include the Opening Liturgy to start the school year; Thanksgiving, Christmas, and Easter holidays; and the Baccalaureate Liturgy to end the school year. The Baccalaureate Liturgy is for all graduating students and is an integral part of the Commencement activities. Lecture course-one-half tuition; Laboratory course-full tuition (laboratory courses include those with related laboratory, performance, clinic, or studio activity). A student wishing to change majors should discuss his or her plans with the current department chairperson and with the new department chairperson. Approval from the new chairperson is required. The change becomes official when the completed Change of Curriculum Form is returned to the Registrar. 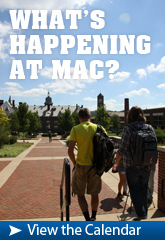 Tuition will not be recalculated after the Add/Drop period for a change of major. A student may lack up to a maximum of six (6) credits or one course (if more than six credits) and may apply to participate in the commencement ceremony (see Graduation Requirements #5). However, the student is not awarded a degree until that semester in which all requirements are fulfilled. To receive cancelation or delay notice via text or email please register with our MAC Alert system on the MyMAC Portal page. On days that the College will open at 10AM, all classes will run according to the compressed schedule, which is posted both on campus and on the College’s website. Please consider how your schedule would be altered if the compressed schedule is used. In the event of cancellations, Alternative Instructional Equivalencies will be implemented and faculty will communicate with students through Canvas or via email. Members understands that students may have to use their own discretion on challenging weather days. In such cases, students need to contact their faculty members (preferably through email in advance of the scheduled class) indicating that they have special weather-related circumstances that prevent their attendance. It is the student’s responsibility to understand the class requirement and policies as they relate to missed classes and to ensure makeup classes, clinical and/or assignments are completed. 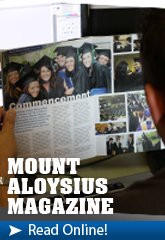 In the past, Mount Aloysius College has closed Main campus and not a satellite campus such as Dubois. This practice is no longer active. When Mount Aloysius College closes or delays the Main campus, all other campuses are also closed or delayed for MAC students, including clinical sites and internships. Closures and delays apply to all undergraduate and graduate classes. Mercy-Value Driven Action Goal: Following the Mercy tradition within Catholic higher education, students will synthesize faith with learning, develop competence with compassion, and make a commitment to justice. e) Think clearly, accurately, precisely, deeply, broadly, logically, and fairly in multiple contexts to ground judgments of fact and improve thinking itself, while also being able to combine or synthesize existing ideas, images, or expertise in original ways and to think, react, and work in an imaginative way characterized by a high degree of innovation, divergent thinking, and risk taking. In general, a student would complete an associate degree with at least half of the course work in disciplines other than the major. Some majors may have specific requirements in the core. In general, a student would complete a bachelor’s degree with at least half of the course work in disciplines other than the major. Some majors may have specific requirements in the core. five years have passed since the student has completed the previous bachelor degree. In this case, advisors will recommend taking a 200-level course, but it may not be required. The student will still be required to complete ICT 301 - Professional Information Communication Technologies to ensure he or she learns about the value of information fluency skills in the changing workplace and applies that knowledge to professional and personal goals. A student who has completed a bachelor’s degree should follow up with the Registrar’s Office to ensure the waiver is applied to his or her academic record. A student may still choose to take any of the ICT courses to strengthen his or her Information Communication Technologies knowledge and skills. * See additional information under heading Incomplete Grades. **In Progress grades are generally given to students who are registered for continued fieldwork or practicums. These grades must be resolved by the end of the following semester. Grades of “P” and “W” are entered on the student’s permanent record but are not computed in the grade point average. The time of withdrawal affects the grade for the course. Withdrawal from a course will incur a grade of “E” if permission has not been granted. At the end of the seventh week of semester courses and at the fourth week for eight-week courses, instructors will submit mid-semester grades for each of their classes. It is the responsibility of all students to meet with their assigned advisor for advisement. If a student is demonstrating at-risk performance at mid-semester, the advisor will discuss this situation with the student and will prescribe the level of remediation necessary to ensure that a student has the opportunity to raise his/her GPA by the end of the semester. Various methods of remediation may be used including routinely scheduled meetings with the advisor, with the Student Success and Advising Office, with the College counselor, etc. The Committee on Academic Support will be advised via the Academic Intervention Form of all related actions in this regard. A student completing a concentration, certificate, and/or specialization as part of his or her program of study need to complete each course in the concentration, certificate, and/or specialization with a grade of C or better. Completed a minimum of 60 credits for the associate degree. Completed a minimum of 120 credits. Ultimately, each student is personally responsible for checking eligibility for graduation by ensuring he or she has completed all general and curricular requirements. These requirements may be discussed at any time with the student’s Advisor or Department Chairperson. 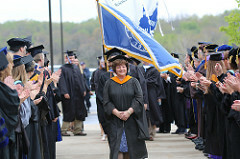 Mount Aloysius College conducts graduation ceremonies for students. The formal Commencement Ceremony is conducted only in May. Please refer to the Commencement Activities-Participation section of this Catalog for information regarding participation in the ceremony itself. Students may petition their instructor after approximately 75% of the course has been completed usually for extenuating circumstances beyond the control of the student (i.e., prolonged illness, jury duty, family emergency, etc.). If permission is granted, the instructor will submit a grade of “I” at the conclusion of the course. The work must be completed within the guidelines provided below based on the original length of the class in which the “I” grade is issued. If the work is not completed, a grade of “F” will be noted on the student record. The Registrar may approve a request for an extension beyond the allotted completion period. NOTE: Incomplete grades can only be given at the end of a semester; they cannot be issued at mid-term. Students wishing to pursue a degree at Mount Aloysius College must matriculate by completing an application and by being accepted into a degree program. To ensure proper advisement, this should be done as soon as possible after commencing college study. Once admitted, students who break matriculation for any period of time, must reapply through the Office of Undergraduate and Graduate Admissions. Students are subject to catalog policies in effect when admitted. Some courses may require matriculation as a prerequisite. In any case, matriculation must occur after fifteen (15) credits have been earned at Mount Aloysius College. Graduation requirements must be completed within seven (7) years of acceptance into a degree program. If a student, whose work prior to the date of the final examination is of a passing grade, misses a final examination because of documented illness or emergency that occurred after the twelfth (12) week of the semester, he/she may be given the mark of “I” (Incomplete). No student is allowed to retake a final examination or do extra work after the final for the sole purpose of improving his/her grade. Students who fail a required course must retake the same course with a grade of “C” of better unless otherwise specified by the department. A student may only repeat a course in which a grade of D, E, or F has been received. The course may only be taken a maximum of three (3) times. The most recent grade will be used in the computation of the grade point average on a student’s transcript. If the repeated course is required in the major, the grade must be “C” or better to automatically remove the D, F, or E grade in the grade point computation. A course repeated at another college will not remove a D, E, or F from the student’s transcript at Mount Aloysius College. *Note: Please also see the Financial Aid section on the definition of a full time students and the relationship to repeated course work . Students must complete their final thirty (30) semester hours before graduation in residency. This policy applies to students in associate and bachelor degree programs. This policy does not apply to students enrolled in identified cooperative or articulated programs in the College’s cooperative programs. Exemptions to the residency requirement may be made by the Registrar in individual cases. The student wishing to officially withdraw from Mount Aloysius College can obtain the required form from the Registrar’s Office. The student should obtain their advisor’s signature on the form and is strongly encouraged to discuss the decision to withdraw with their advisor. The completed form must be turned into the Registrar’s Office to officially withdraw from Mount Aloysius College. The Registrar will notify the student’s advisor, the Business Office, Student Accounts, Financial Aid, the Director of Retention and Advising, and the Office of Student Affairs. Students should be aware of the consequences of failing to complete an official withdrawal form. Additional information regarding withdrawal is available in the Tuition and Fees Section of this catalog.